Give your home personality by enhancing your rooms with appealing and enduring tile flooring in Feasterville, PA. Tile floors provide the look you want easily because they come in so many colors, shapes, patterns and styles. Stop by our expansive flooring showroom to speak with one of our friendly and helpful specialists today. We’ll show you how tile floors perfectly blend eye-catching aesthetics with remarkable durability to improve the attractiveness, functionality, and value of your property. All of these benefits come at a very affordable price. Install new ceramic tile, porcelain tile, or slate tile flooring without going over budget. Being on a budget shouldn’t prevent you from creating a beautiful look for your home or business. That is why our team encourages frugal customers to consider our elegant and affordable ceramic tile flooring products. A budget-friendly option, ceramic tile delivers top-of-the-line appearance and durability that enhances the value of any room. Once combined with the right glaze or sealant, this flooring option not only gives you the attractive floor you have always wanted, but it has the toughness necessary to stand up against stains, high humidity conditions, and water damage. This gives ceramic tile the ability to work just as well in kitchens and bathrooms as it does in living rooms, bedrooms, or dining rooms. Strong ceramic tile is also unlikely to chip or crack. Choose resilient flooring that also features a modern look that is simple and stylish. Capable of retaining their contemporary color and beauty while holding up under heavy foot traffic, porcelain tile is a popular choice for homes with children and pets as well as for offices and other commercial businesses. This impressive flooring option gives you the ability to create a truly unique look for your property. It also lets you show off your one-of-a-kind style without worrying about moisture problems, fading, staining, or scratching. Even after years of heavy usage, your porcelain tile floors will continue to look fantastic. Porcelain tile is a forward-thinking flooring option that is as aesthetically pleasing as it is strong. Just choose your preferred style, color, design, and texture from our huge selection and then let our team install it for you. Make sure you browse our huge selection of tile flooring options from such brand-names as Floorcraft and Design Distinctions at our showroom. Now that you’ve ordered your beautiful new tile flooring, it’s important to know how best to keep it looking brand-new. While tile floors are resilient, water-resistant, and capable of standing up to all sorts of wear, they still have special requirements when it comes to cleaning. Always wipe up dirt and spills promptly with a wet microfiber cloth or dust mop to prevent your floors from looking dull. As long as you clean up spills immediately, you don’t need to worry about stains or discoloration. To clean your tile, use a non-abrasive, gentle cleaning solution to avoid causing damage to the tiles. To keep your grout looking clean and bright, it’s best to use a grout sealer that prevents liquids and dirt from penetrating the grout and making it look dirty. You can also clean your grout using a scrub brush and soapy water, or by hiring a professional steam cleaning company periodically. 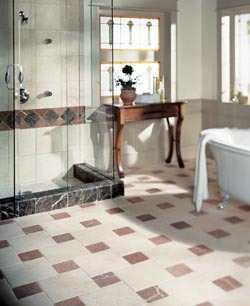 With proper care, your tile flooring will look phenomenal for many years to come. When it comes to upgrading your home or business one of the most cost-effective yet impressive options you can have is the ability to customize your floors. An interior designer’s dream, ceramic tile gives you the ability to manufacture it to your specifications so that your new floor fits perfectly with your design. Whether you want to imitate natural stone or hardwood flooring, this versatile flooring option brings your ideas to life without making you compromise durability or aesthetics. Allow our tile flooring installation service to make your dream floors a reality. When you choose our team to install your brand-new tile floors, you’re protecting your investment and ensuring your floors are installed properly. We make sure to properly and completely remove your old floors, prepare the subfloor, and install your new tile flooring so that it is even, level, and doesn’t leave any large gaps through which water and dirt can affect your subfloor. In addition, leaving your installation to us means you’re covered by our Lifetime Installation Guarantee. This means that any floors installed by our contractors are covered against installation-related damage for the entirety of their lives. If you ever experience installation-related issues with your floors installed by our team, just get in touch with us and we’ll make it right at no cost to you! Contact us to schedule tile flooring installation with our team. We proudly serve clients in Feasterville, Pennsylvania, and the surrounding areas.